WASHINGTON, DC, February 13, 2012 (ENS) – Cuts to the National Weather Service’s 2013 budget proposed by the Obama Administration today would reduce the number of information technology officers at weather forecast offices across the nation, jeopardizing lives and safety in extreme weather events, warned theNational Weather Service Employees Organization. “The ITO position is crucial to the lifesaving work of weather forecast offices,” said Dan Sobien, president of the National Weather Service Employees Organization. The National Weather Service is an agency within the Commerce Department’s National Oceanic and Atmospheric Administration, NOAA, and the warning from employees is in direct contrast to the statements of their boss, NOAA Administrator Dr. Jane Lubchenco. The budget provides $1.8 billion to continue the development and acquisition of NOAA’s polar-orbiting and geostationary weather satellite systems, as well as satellite-borne measurements of sea level and potentially damaging solar storms. These satellites are critical to NOAA’s ability to provide accurate weather forecasts and warnings that help to protect lives and property. But the President’s FY 2013 budget calls for a reduction of $39 million in funding for operations of the National Weather Service. Additional 2013 budget cuts propose eliminating research on improving hurricane intensity forecasts and the air quality forecasts. “I think if the federal government can afford $39 million for the Blue Angels and $325 million for marching bands, it can afford $15 million to provide its citizens warnings of severe weather,” he said. “It may not be this year or next, but if these cuts go through, the nation will see another Katrina-like event, and it could have been entirely preventable,” Sobien said. Lubchenco did acknowledge that more extreme weather events are happening more frequently. 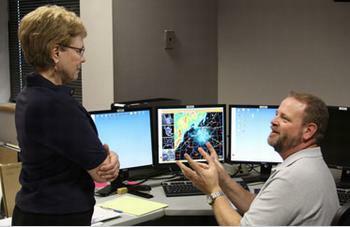 Because information technology officers are meteorologists with IT skills, they are frequently used to cover shifts and assist weather forecast offices during severe weather, in addition to their regular duties. During an emergency response, ITOs are crucial to a weather forecast office’s local ability to innovate immediate lifesaving products and services, said Sobien. The National Weather Service assessments on the historic 2011 tornados across the Midwest and the 2010 Nashville flood event commended offices for having information technology officers on station during the event to help with weather and IT issues.